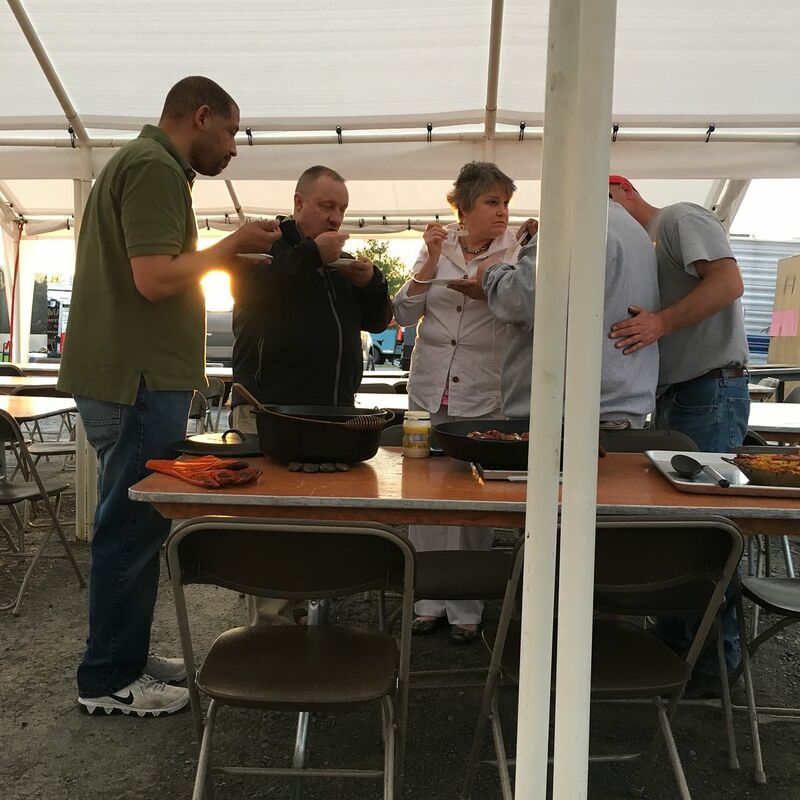 Part of the festivities last weekend at The Ironman BBQ competition was a friendly, informal Paella cooking throw down between a few of the teams. No cash or trophies were on the line. Just bragging rights. Sometimes, bragging rights are enough. 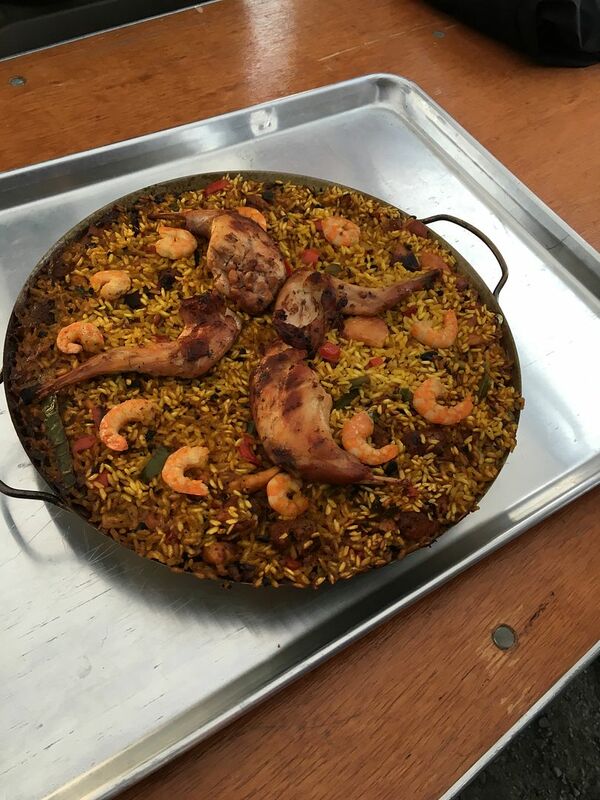 The only problem, I have made Paella exactly twice before in my life. Once on the stove and once a month or so ago on the grill to prove to myself that it could be done. My grill experiment was a partial success. Based upon those results, I dove into the competition headfirst. What else is there to do the night before a BBQ competition, right? To start, I lit one chimney full of charcoal and placed about 1/2 a chimneys worth of charcoal off to one side of my Weber kettle. 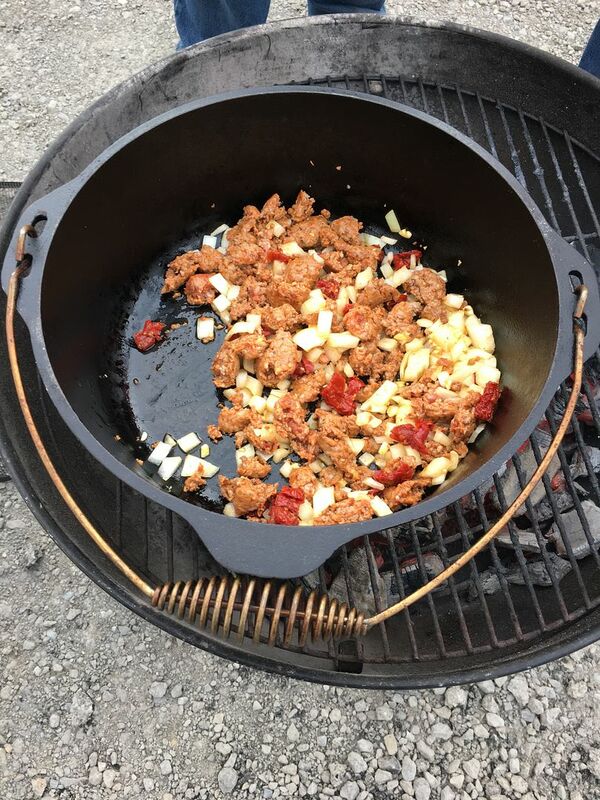 Once the coals were ready, I spread them off to one side, put the grill rack in place, and heated up my nine quart cast iron dutch oven with 1/2 tbsp of the tomato oil. 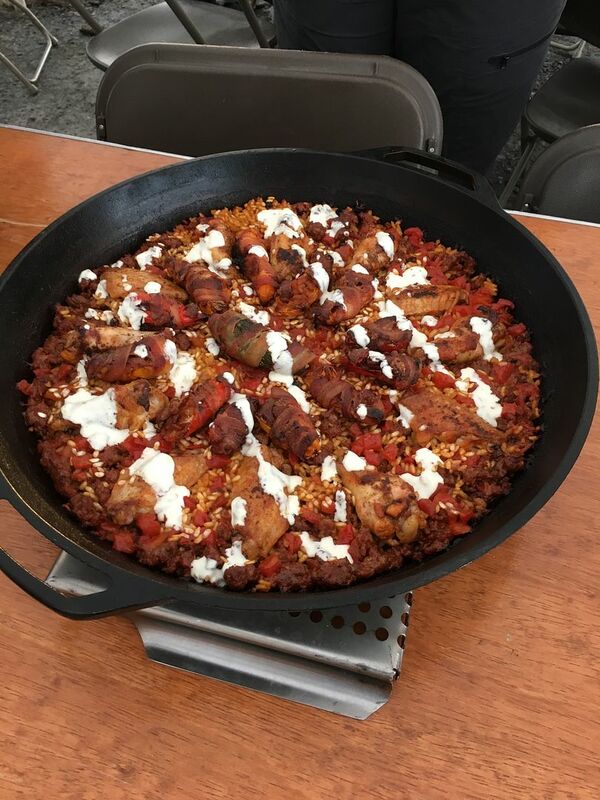 Once the oil was hot, I added my chorizo. I stirred the sausage until it was starting to turn brown and crumbly. At this point, I added the minced garlic, onion, and sun dried tomato and sautéed this mixture, stirring fairly constantly, until the onions were getting translucent. Next, I added the rice and allowed the mixture to cook for five minutes, stirring occasionally. Finally, I added the dry spice mixture and sautéed this mixture for five more minutes. Next, I added the clam and chicken stock along with my scallops, stirred the mixture thoroughly, placed the cover on the Dutch Oven and the grill, and walked away for 30 minutes. While waiting on the rice to absorb the liquid, I thinly sliced my jalapeño and prepared my aioli. After 30 minutes of simmer time on the grill, the rice mixture was almost done. At this point I added my sliced jalapeño and peas and replaced the cover on the Dutch Oven for 10 more minutes. Then, I removed the Dutch Oven from the grill and let sit for 10 more minutes. 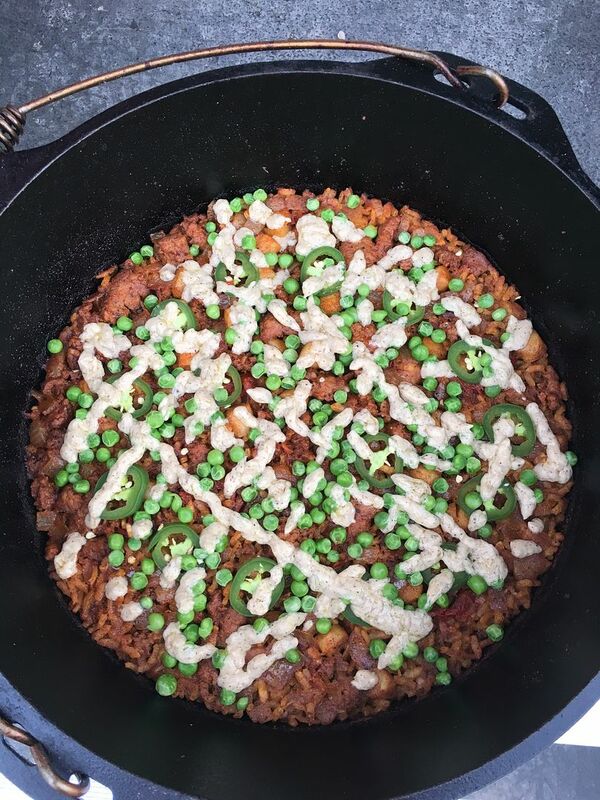 Then, I drizzled my aioli over the top of the Paella. Wallah, done! 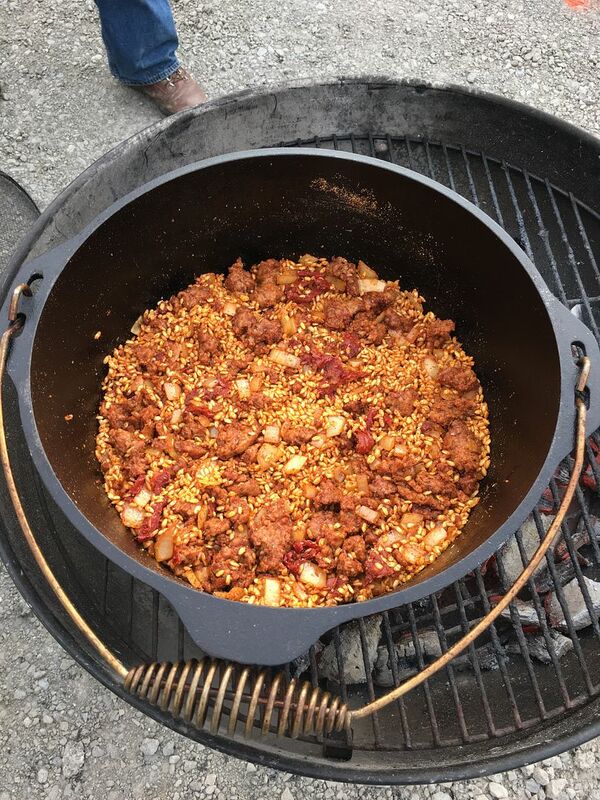 It was going to be hard to beat the Paella King, Terry West. As the judging was open, comments were offered to the three chefs. Our comment was that Three Dogs would have won had we had some crust, or Socarrat, on the bottom of the pan. Close, but no cigar. Terry may have won this time, but we will meet again. Well done.